Diaper cakes are an adorable way of gifting diapers to babies by arranging them in the shape of a cake. These diaper cakes make the best centerpieces at baby showers; they can also be used to reveal the baby’s gender. MomJunction tells you how to make a diaper cake and the different ideas of making a diaper cake. How to Make A Diaper Cake? Diaper cakes are usually made in two ways: a rolled cake and a folded cake. They can be as small as two tiers or as large as five tiers. Diaper cakes can also be customized as per the theme of the party by decorating with ribbons, soft toys, bows, etc. Baby items such as booties, washcloths, stuffed animals, etc. Roll all the diapers and secure each with small rubber bands. Once you finish rolling all the diapers, place the folded diapers around the tall object. 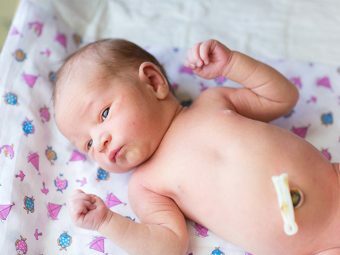 Wrap the larger rubber band around all the diapers. Make another diaper layer on the top of the base layer, but, this time, reduce the number of diapers. Repeat this until the central object is immersed in the layers. You can use lace, fabric or thick ribbon to wrap around the layers of the cake. To bind the cake, start at the back of the cake, wrap around the layer and secure both the ends with tape or pin. Stick the soft toy on top of the cake and place the ribbons at different places; you can also stick the booties, washcloths, etc. Here is one of the easiest ways to make a diaper cake. 3 round containers in decreasing order of size. Stack a few diapers into the container (which has the depth to immerse half of the diapers) with the folded edges facing inwards, continue adding more diapers such that they form a circle and fill the entire container. Tie all the diapers with the large rubber band. Once you are sure the diapers are secure, remove them from the container. Repeat the same with the other containers. Stack the three diaper layers from the largest to the smallest and wrap ribbons around the rubber bands. Now, decorate the cake using the washcloths, soft toys, etc. Now that you have learned the basics of making a diaper cake, let’s see some great diaper cake ideas from both the segments. 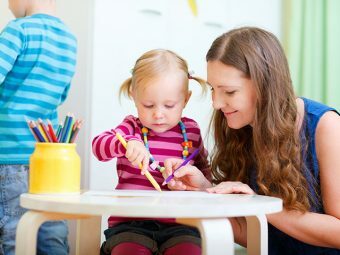 Here are some exciting ideas you can use for gifting diapers, creating a centerpiece at a baby shower, or decorating your home to welcome the baby. This is a perfect gift for a friend who is going to have a baby girl. Since pink is popularly related to girls, we have used the same. You may choose any other color as well. Make the base diaper cake by either folding or rolling the diapers. Wrap pink color ribbons on each tier and make a large bow at the top tier. You can also hide small washcloths, pacifiers, baby rattles here and there on all the tiers. Stick a mini girl dress at the center of the cake to make it look more girly. You can put bunnies, puppies and milk bottle stickers on wooden sticks and pop them at the center of the cake for adding more details. This is a simple yet useful gift for a new mother. Make a three-tier diaper cake using the folding or the rolling method. Wrap each tier with brown-colored paper ribbons that are wide enough to cover the whole tier. Wrap blue and white satin ribbons around the paper alternately on each tier. Make blue and brown bows and stick them at the center of each tier. Make blue and white paper roses and stick them outside of the two lower tiers. You can also replace these roses with small baby toys, washcloths, pacifiers, etc. Place blue and white knitted booties on the top to finish off the look. If you are organizing a baby shower for your friend or family, you may want to have a diaper cake as the centerpiece. Make a three-tier folding diaper cake. Now decorate the cake as per the theme (this is the idea for a baby boy’s baby shower). Wrap around blue ribbons on all the tiers of the diaper cake. Stick flowers or toy cars on the tiers. 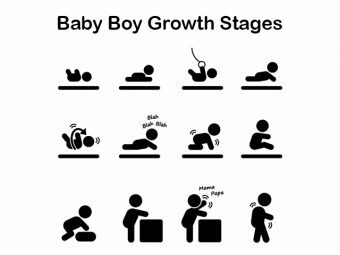 You may alternate between baby products such as lotions, diaper rash creams, powders, etc. On the top tier, use tiny shoes or teddy bears. You can also hide objects such as pacifiers, rattles, teethers inside the rolled diapers as a surprise gift. This is a gender neutral diaper cake idea and is customizable into any theme. Take a rectangular or round-shaped box, the size of this box determines the size of the cake. Cover the entire box with coloring paper. Roll the diapers and place as many as you can inside the box. Cover the outside of the box with a row of vertically placed diapers, secure these diapers with a string. Create a smaller tier above it. For the balloon, use a paper balloon lantern — the size of the balloon should be in proportion with the basket. Use satin ribbons, bows or paper letters to decorate the balloon. You can also make paper buntings to hang around the basket. Insert 2 wooden dowels into the corners of the basket, see that all the dowels are at a similar height and insert the lantern on the top. If there is any space left in the basket, fill it with baby products and soft toys. Gender revealing parties are the in-thing now. Here is a diaper cake idea for such parties. Here you do not know whether it is a boy or girl, so pick, blue and pink as they universally represent boy and girl. Make a three-tier diaper cake and cover each tier completely with satin cloth giving the illusion of fondant. You can either alternately cover the tiers in pink and blue satin cloth, or cover half of each tier with the two colors. Cut out thin stripes of blue, pink and white paper and curl them using a spoon, stick these in a bunch at the top of each tier. Place a shimmering blue and pink ribbon on top of the last tier. You can also use tiny Mickey and Minnie mouse soft toys. Cut Mickey and Minnie faces out of a black paper, write “Pink or Blue” and stick them on the center of the cake. This will be a cute diaper cake. Divide the snail into parts and then work on each section. The base: Roll individual diapers and secure each of them with rubber bands. Make a round base tier and secured it with strings. The head: Use a slightly small container and make a tier using the folding diaper cake method. The neck: Roll four diapers and arrange them in the form of a cube. Secure the whole setup with strings. Wrap satin ribbons around the strings of all the parts. Assemble the parts using glue on the base tier and add details such as the antenna. If you have some extra place, then fill it with soft toys, washcloths, and baby products. This idea is small yet has great detailing. Make a two-tier diaper cake, take care that the second tier is smaller than the base tier, so that you will have additional space to add details. Wrap each tier with broad satin ribbon. Decorate the bottom and the top of the cake with big pink flowers. Place a few toy bugs and flowers here and there within the spaces. This diaper cake idea works for any gender. Make a three-tier folding diaper cake and wrap blue satin ribbons around each tier. You can also write the baby’s name on the bottom or the middle ribbon. Roll five diapers wrap ribbons on each, place these diapers on either side of the tiers as well as on the top of the diaper cake. Make blue color cones and flags out of craft paper, stick the flags on top of the cones using glue. Now slide these cones on top of each of the 5 diapers to give the appearance of a castle tower. You can add additional details and customize as per the gender of the baby. This is a unique diaper cake idea which can be made from scratch at home. Take an empty shoe box and glue its lid to the body on one side vertically. Stick colored paper inside and outside the shoe box, wrap it with baby cloth and secure the ends. Make four rolling diaper cakes and insert a folded diaper in the middle of each. These work as the tires of the cradle. Wrap ribbons on each tier as well as the cradle. Stuff as many diapers as you can inside the shoe box and cover it with a baby blanket. Now position the cradle on four tiers. If you have any space inside the cradle fill it up with baby toys. This can be hung on the door as a welcome gesture for the new mommy and her little one. Measure the diameter you want your wreath to be and cut out a cardboard circle. Cover the entire circle using glue and white paper. Roll the diapers and secure them with rubber bands. Wrap satin ribbons around each of the rubber bands. Now stick the diapers on the wreath, covering the whole circle. Insert washcloths, small stickers, and soft toys all along the circle to make it more appealing. Poke a hole at one end and tie a ribbon or string to hang the wreath. Diaper cakes are the best option if you want to go for an unconventional gift. Hope these ideas have sparked your enthusiasm to try and make one. 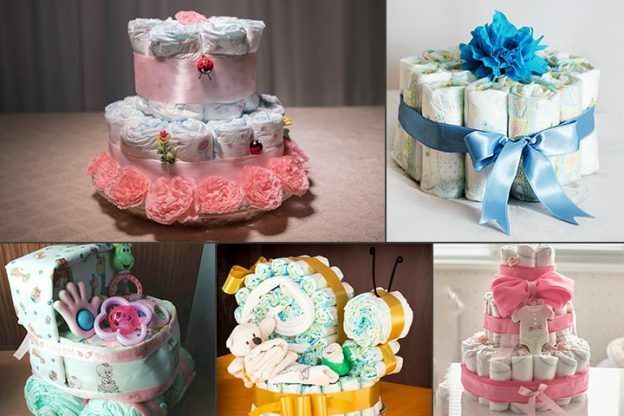 Did you try making a diaper cake? Let us know in the comments section below. Is It Safe To Color Your Hair During Pregnancy? 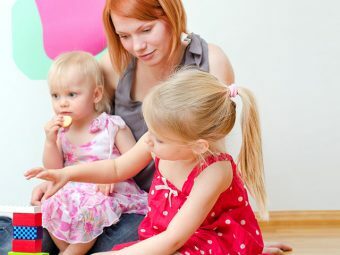 How To Choose A Good Babysitter?